In my last post, I shared the Buckeye Brick quilt I recently finished. I mentioned that it was the second time I've used this pattern. So today I'm going to finally share my first brick quilt, made in 2015 for the new baby of a mama friend from D's school. One day, when Danielle and I were chatting about the baby, she told me that she chose mint, gold, and black for the colors in her nursery. I was intrigued and asked if I could make her a quilt in those colors. At the time mint was hard to find and metallic prints were not as ubiquitous as they are now. I was on the hunt! The only print I could find with all the colors was a chevron print from Spoonflower. I love the creative designs on the site, but I haven't been as happy with the fabric quality. Even the most basic selection is more than twice per yard what I usually pay by shopping sales, so I don't shop there often. But in this case, Mrs. Hervi designed the perfect print to pull the colors together. This is a really easy quilt to make, just 4.5" x 8.5" blocks and 2.5" sashing. It's a great way to use larger prints. Danielle wasn't keeping the baby's name a secret so I was able to make letters on my Silhouette to personalize the quilt. For the back, I used a super soft minky. It creates such a mess, but little ones love the cuddle fabric. Exhibit A. And this is why I am saving to replace the carpet in my craft room! 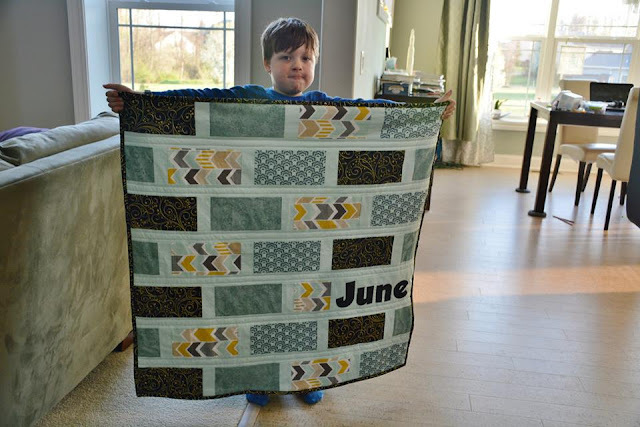 The best thing about these throwback quilt posts are the pictures of my sweet boy. Now my "little boy" is a big ten year old, and "baby" June is nearly four! For the label, I used one of my favorite verses of the Bible. As it turned out, Danielle was a trendsetter (no surprise to me!). A few months after I finished June's quilt, I saw this display at Joann! One of my goals this year is to finish writing posts for each of my quilts. This quilt was finished in 2015. You can see what I'm currently working on by following me on Instagram at deJongDreamHouse. Great quilt and I love the verse on the label. I put verses on my quilt labels too. I am going to use this verse for the next baby quilt I make. 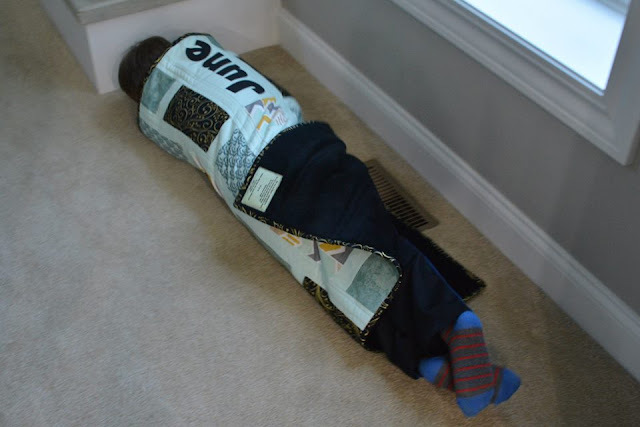 Wow, great quilt!! Mercy, Spoonflower is WAY expensive! I get that they are creating very small amounts of fabric and that creating the stencils (or whatever they do to make the prints) is time consuming, but wow! On the other hand, I'm glad they aren't low-balling the value of what they do, because obviously people are willing to spend that amount to get the exact fabric they want. Definitely a niche business. I'm sorry the quality isn't want you expected. Kiddos grow up way too fast!! My baby is almost 29!! 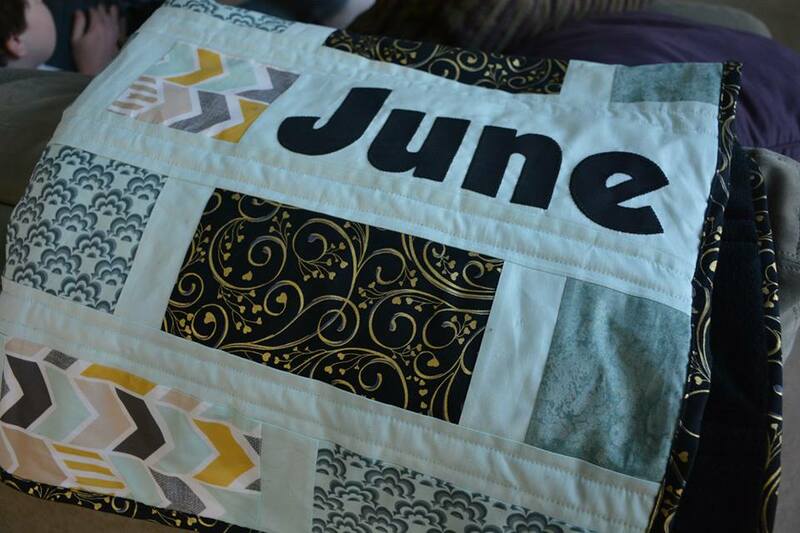 It's a great quilt, Jen, and I'm sure June loves it! I'm glad your sharing your older quilts. 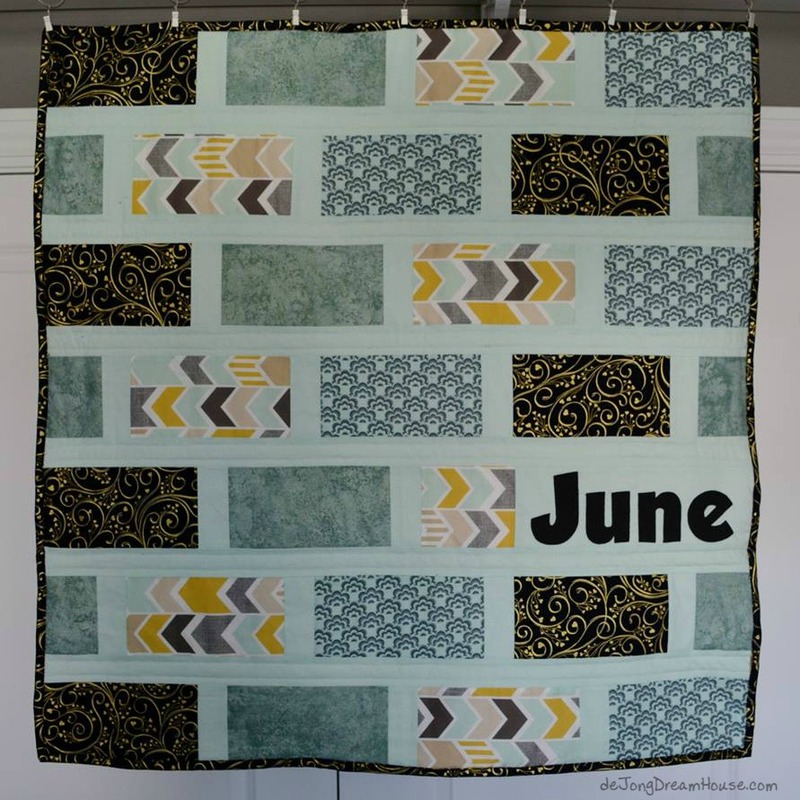 This looks like a great pattern for a quick quilt! 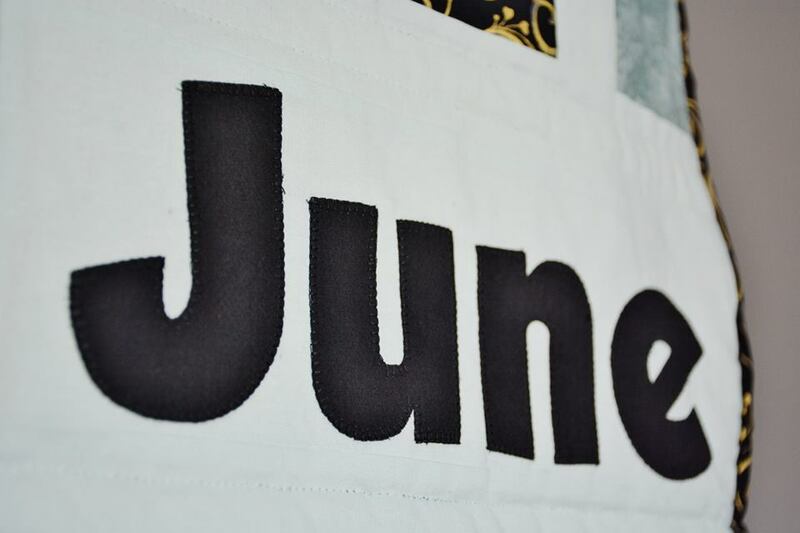 The addition of June's made it extra special. Nice, soft minty color - I should get some! I do love that color combination, and the print from Spoonflower is fantastic! I do agree about loving their designs, but not being keen on the fabric quality. It is so hard to pay twice the price of quilting cotton for their fabric! Gosh I had no idea Spoonflower was that expensive! But if you get the perfect fabric for a project it's worth it. Surprising that the quality isn't what you like. I'll have to give it a whirl sometime and see. Meanwhile, what a surprising color combination--mint, gold, and black! So very pretty in your brick quilt. Thanks for sharing on Wednesday Wait Loss. This is a really pretty quilt, and price and quality aside, the chevron print was exactly right. I can see why you made your exceptions for this one.